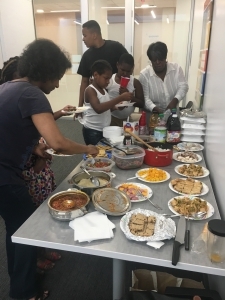 Following on a successful inaugural international potluck in April, Learning Life will hold potlucks periodically to bring together our DC families and volunteers to learn about food and the world. 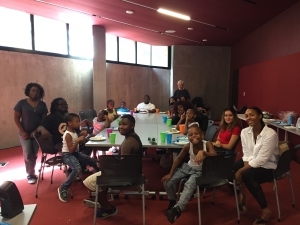 The second potluck, held in June, discussed the challenges families face raising kids in today’s world. July’s potluck considered participants’ experiences of school lunches given a photo album we viewed featuring common schools lunches in selected countries. August’s potluck will occur on Sunday, August 27 — the first anniversary of Learning Life’s CDI — and will look back at what we have accomplished in the first year. Beyond August, future potlucks will feature invited speakers talking about refugee crisis and immigration, world health, countries and their cultures, and more. Interested observers are welcome to all our potlucks. Our international potlucks generally occur on occasional Saturday or Sunday afternoons in Washington DC. Please contact us at email@learninglife.info if you would like to join us at an upcoming potluck, and/or if you would like to present on an interesting world topic. We ask adult attendees with experience abroad to make or buy a foreign dish they like, and to be prepared to explain the dish’s ingredients and country of origin.